Ghostlight Records recently released the Original London Cast Recording of the musical Sister Act, to coincide with the show's opening on Broadway. Olivier Award nominee Patina Miller is Deloris Van Cartier, the excitable and worldly showgirl hiding from mobsters amidst the nuns of St. Catherine’s. With a musical score written by the great Alan Menken (Little Shop Of Horrors, The Little Mermaid, Beauty And The Beast), and lyrics by Cheri and Bill Steinkellner ("Cheers"), this is a case of matching a lead performer nearly perfectly with the songs. 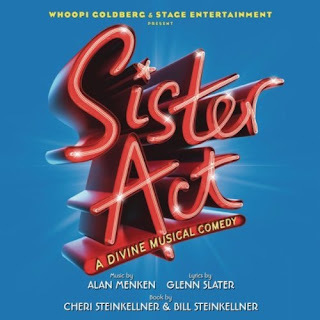 Sister Act follows essentially the same story line as the movie of the same name, with Deloris both transforming and being transformed by St. Catherine’s. The all-original score captures the sass and wit of the movie without mocking or copying too closely, segueing gracefully between 1960's Motown, 1970's disco/soul/pop and classic Broadway styles. The flow of the album is amazing, the voices all top notch. Highlights include the over-the-top "Fabulous, Baby! ", the darkly-veiled platitudes of "When I Find My Baby" and the self-realization of "The Life I Never Led". As an album, the ending is a bit anti-climactic and trite; a clear case of the pop/Disney-ization of Broadway in its purest form. Nevertheless, the cast album works on several fronts. Don't be surprised if Sister Act earns a handful of TONY nominations this coming year. Learn more about Sister Act at www.sisteractonbroadway.com. Sister Act: A Divine Musical Comedy (Original London Cast) is available from Amazon.com on CD or as a Download . The album is also available via iTunes.